Peter Mullan and Nastassja Kinski. Michael Winterbottom is a director well known for working across a multiplicity of genres. His second attempt at a Thomas Hardy adaptation, following the 1996 movie Jude based on the novel Jude the Obscure, was a British western, yes that’s what I said, that rarest of animals a British western! Of course there have been previous films that matched this genre but to be fair not that many even if you count Carry on Cowboy (1965). The only other one that’s comes immediately to mind is the truly bizarre The Singer Not The Song (1961) which I saw in the confines of the vast Angel Odeon in Islington on its release (well it does star Dirk Bogarde!). The Claim (2000) can probably be described as an epic; it was shot at the Fortress Mountain ski resort in Kananaskis County, Alberta, Canada, which is located in the foothills of the Canadian Rockies were the average temperature is -13.2c but can dip as low as -50c. In fact the cold climate made the making of the film an ordeal and even the director was said to have suffered from frostbite. 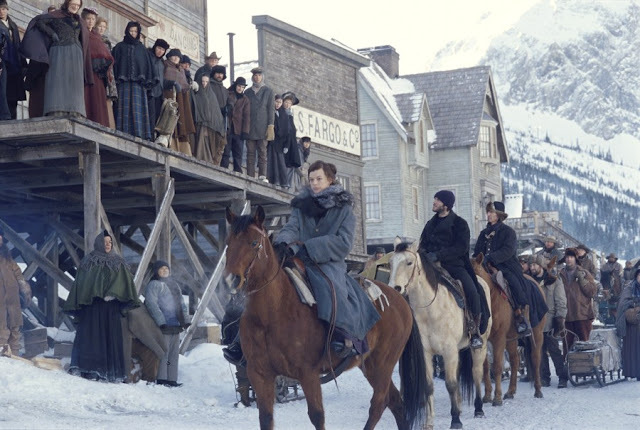 Its 1867 and we are in prospecting town of Kingdom Come where it always appears to be deep in the depths of winter. This desolate place is owned and run by an Irish immigrant Daniel Dillion (our very own Peter Mullan) who amassed a fortune during the Gold Rush of 1849. Dillion desperately wants the railroad to come through his town and to that end invites the Central Pacific Railroad surveyor Dalglish (Wes Bentley) to conduct a survey of the surrounding area. Also arriving in town are two mysterious women (Nastassja Kinski and Sarah Polley) whose appearance is obviously coursing Dillion some torment, we are taken back some twenty years to discover the reason. The film boasts some breath taking scenery photographed by Alwin Kuchler, known for his work on, amongst others, the two Lynne Ramsay films Ratcatcher (1998) and Morvern Callar (2002) and the recent Joe Wright thriller Hanna (2010). The screenplay was down to regular Winterbottom collaborator Frank Cottrell Boyce and Michael Nyman best known for his multi-platinum soundtrack album for Jane Campion’s 1993 award winning movie The Piano composed the original score but unfortunately the film was not a financial success. More of an interesting curiosity than a great movie, very visual with Mullan giving his normal convincing performance which is not necessarily the case with some of the other members of the cast.